Gaige showcasing his Caramel Pull-Aparts right before everyone in the office takes a bite. Brittni Jordahl could smell the sweet goodness before she saw it. The culprit? 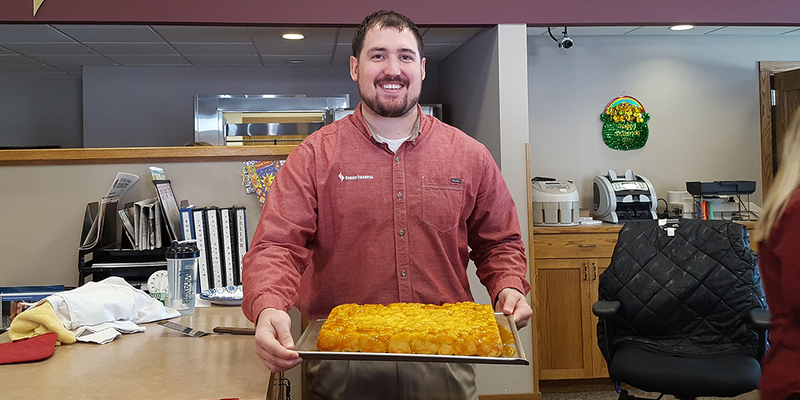 A freshly baked batch of homemade caramel pull-aparts; a special treat from Gaige Dunn, Credit Banker and unofficial resident chef at Choice Bank in LaMoure, ND. You might recognize Gaige’s name from another Rise Up: The World’s Biggest Cheese Curd Fan . “Can you tell I have a healthy diet?” he said with a laugh. Gaige has what he calls an appreciation for soul food. Whether it’s cheese curds from the local Centerfield Bar & Grill, a steak grilled to perfection, or heavenly caramel pull-aparts — he’s made a name for himself as the foodie guy at the office. And he loves sharing that love with others. During the Fall harvest, Gaige and some coworkers made fried egg sandwiches, wrapped them in tin foil, and handed them out to customers. It was a huge hit. Another time, he and Brent Thielges, Location President made ribeye steak, potatoes, shrimp, and lobster to share at one of Choice Bank’s cook-offs. I mean, seriously. “I tend to find myself cooking at work a lot,” Gaige said, laughing again. The caramel pull-aparts are a crowning jewel on Gaige’s Choice Bank menu. And they’re no ordinary pull-aparts. Gaige first tried a batch from his mother-in-law, and was instantly floored. The secret behind the recipe? Making it all from scratch. All of it. “I was like, ‘Where did you get this? !’” Gaige said. The secret behind the recipe? Making it all from scratch. All of it. With recipe in hand, Gaige was determined to recreate these caramel pull-aparts for his family. “We’re gonna inhale this stuff,” he told them. 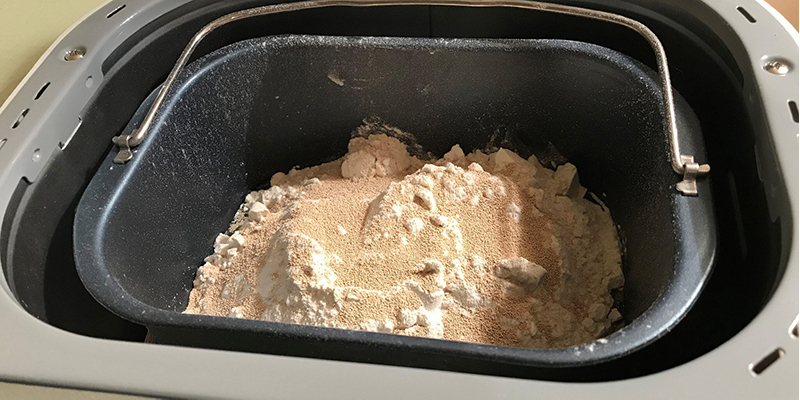 First — pour the wet ingredients in the breadmaker; this part is tricky, Gaige explained, because everything has to be at the right temperature or else you’ll kill off the yeast. Pile it and tier it before mixing. Then, let the breadmaker do its job for an hour and a half. “You hear it roar and rip around,” Gaige described. “And then when it’s almost done, you smell that bread smell throughout the whole house.” Then take the pan and butter it up. When the dough is ready, pull it apart and flick it on the pan in little globs. Prepping the dough for the oven. The caramel sauce, the grand finale, is made with the only not-made-from-scratch ingredient: a JELLO Cook-To-Serve vanilla pudding mix, a stick (or a stick and a half, Gaige’s version) of butter, some brown sugar, and a splash of milk. Melt it all together, whisk, and drizzle over the dough. Then, let it rise overnight before throwing it in the oven in the morning. When they’re done, flip them over and let them cool so the caramel can soak in. Fluffy and golden, the pull-aparts are just about done! Gaige made the caramel treats a few times for his family with great success. Even his daughter Layla, normally a picky eater, wolfs them down. This winter, he decided these legendary pull-aparts deserved to be shared. Still warm from the oven, Gaige brought the breakfast dessert into the office Monday morning and set them in the kitchen. Brittni and others quickly gathered around. “The hardest part is waiting for them to cool down,” Gaige said. What happens with these small gestures, however, is a lot bigger than just caramel pull-aparts. It brings the team together over something they all enjoy. What he didn’t mention, was that he did all this with a two-week-old daughter at home and in the middle of the busy season at work. During our interview for this story, we mentioned we would need pictures. Brittni took that as an opportunity to nudge Gaige: “looks like we might have to have more caramel pull-aparts…” They both laughed. And yet, sure enough, that night, Gaige sent over 19 (yes, 19!) 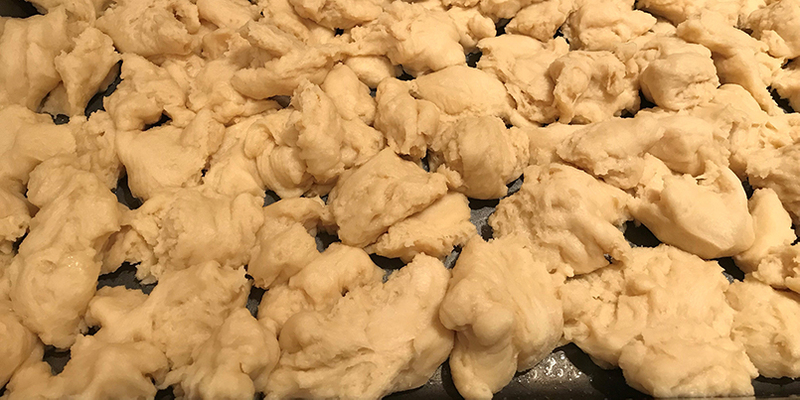 photos of the entire process; from putting the dough together to baking them in the oven to the empty pan after his coworkers finished them off. 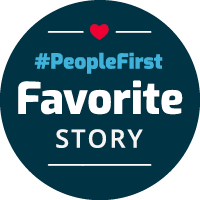 A special shout out for the #PeopleFirst dedication!